Monthly and wall and page a day desk calendars of Italy, 2017. Monthly and weekly wall and desk calendars of Italy, 2017. Looking for a small but perfect Christmas or New Year's gift for the Italophile in your life? You've just found it! Calendars are a perfect way to remember Italy. 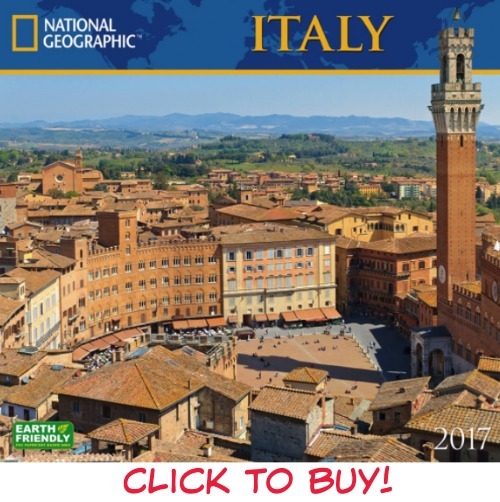 Whether it's to recall your perfect vacation, to plan your future trip, to remember your heritage -- or just to have an Italian dream -- you'll find the perfect calendar in this selection of monthly and weekly wall and desk calendars. Clicking on the title or the pic will take you to Amazon US to buy. 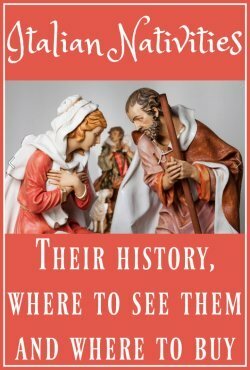 If you're visiting from the UK, click the link in the text. A stunning monthly wall calendar : 365 days in Italy. Stunning pictures, and enough space to make notes. 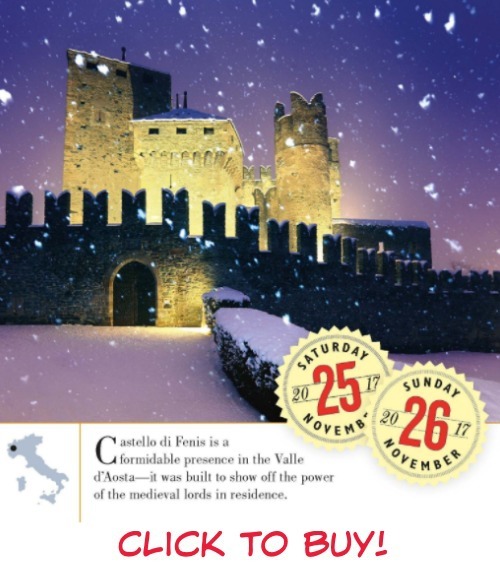 This is one of the most popular wall calendars of Italy - ever. People who buy it once tend to come back and buy it every year. It's that good. Created by Patricia Schulz, who wrote the famous "1,000 Places to See Before You Die", it's a daily testament to the beauty and rich culture of Italy. Each day has its own photo - the photos are stunning - and enough space to make a note of appointments too. Some of the pics you'd expect to see - St Peter's Basilica in Rome, the Colosseum, Venetian gondolas - but others are more unusual: hot springs in Ischia, the water-filled piazza in Bagno Vignoni. It will give you soooo much inspiration for your next trip! Everyone loves this calendar - it's sold over one million copies. The worst anyone has said of it in reviews is that it has too many pictures. Too many pictures of Italy? Is that even possible?! Click the pic to buy if you're in the US. To buy from the UK, click here. 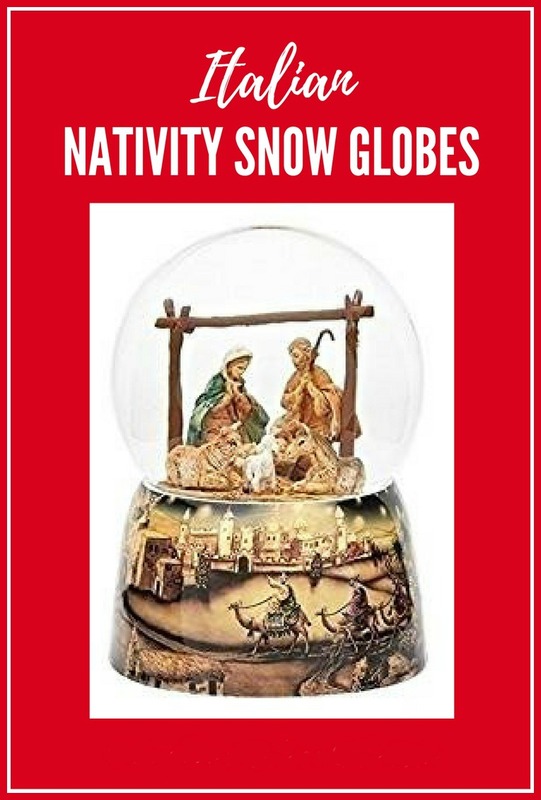 More traditional than the "365 Days" calendar above, this one is produced by the National Geographic magazine and, as you'd expect, the images are large, excellent quality - and stunning. Each month, one full page is taken up with just one big image, so it really catches the atmosphere and light of the place. They're of the all-time classic places to visit: Rome, Florence, Venice, the Amalfi coast - and some of lesser known and stunningly beautiful places such as Siena, the Dolomites and the Gran Paradiso National Park in the Alps. The page underneath is left for the dates, which allows a good space for appointments and events. So if you're not sure you want the smaller pics of the "picture a day" calendar above, this might be just what you're looking for. To buy from the US, click the pic; if you want to buy from the UK, click here. My favourite - the page a day desk calendar. I admit it - I do have a favourite, and this is it. Every year I have it on my wish list and if no-one buys it for me, I buy it for myself. Every day has its own page (except for weekends which have both days on one page), and every page has its own picture of an Italian scene. It might be a place, but it might equally be a typical local dish (cannoli is featured in this year's, yum! ), or a piece of architecture, or a field of sunflowers. As well as the pictures, every page has a short description of what the picture is, and a map of where to find it. So as well as taking in beautiful views, you learn a little about where that view is. 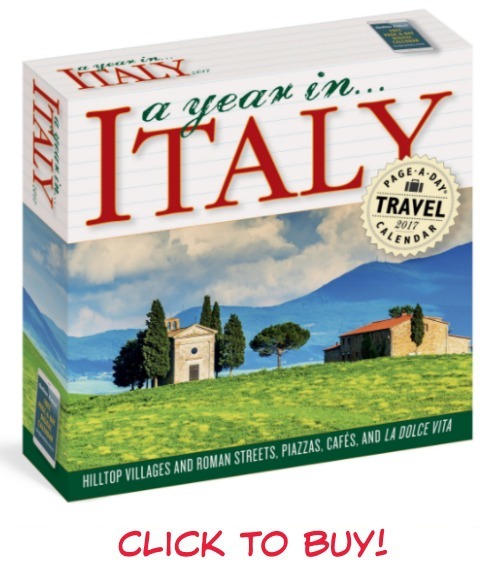 Use it to plan where your next trip to Italy will take you. Everyone tends to choose the obvious places - and there's no doubt that Rome, Venice, Florence, Amalfi are all stunning. But there are other places, too. And you'll find them all here. Keep it on your desk and, when you're feeling overwhelmed by work, look at the pics - and dream. Click the pic to buy from the US, or click here to buy from the UK. I just can't resist showing you one more pic from this calendar - I love it so much... See the detail? Honestly - you won't regret buying this desk calendar. Take it from someone who buys it year after year! 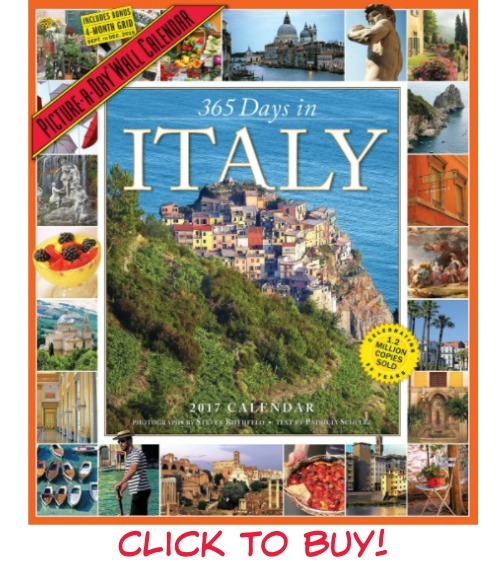 Looking for another type of calendar of Italy? Take your pick! Other great Italian gifts for Christmas.